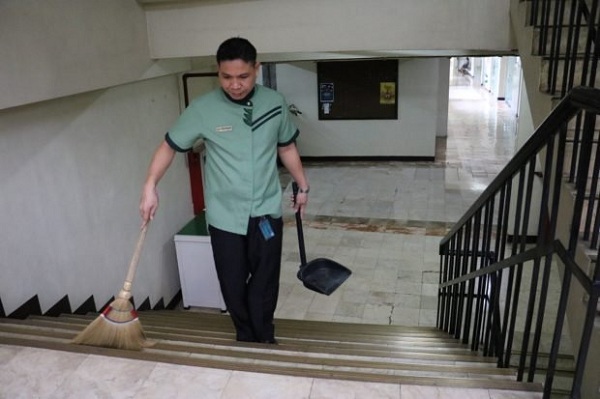 From 4:45AM to 2PM, Emmanuel Ricalde would clean the hallways and grounds of De La Salle-College of Saint Benilde (DLS-CSB) but from 6PM to 9PM, he would be inside the classrooms, attending the lectures! Four years after doing this challenging routine, Emmanuel recently graduated from college – and it was a proud moment for the 38-year-old janitor. Emmanuel revealed that he had always wanted to finish college but that dream was put on hold when he got married and had a family. When his daughter was just 6 years old, she asked what he does for a living. “Janitor!” he replied with pride but he was dismayed upon seeing tears in his daughter’s eyes. It turned out that she and her 4-year-old brother thought their dad works in a white collar job, just like the parents of their friends. Emmanuel knew there was nothing he should be ashamed of but this sad moment would also rekindle his dream of completing a college education and finding a better job than staying janitor forever. He got lucky when he was assigned to DLS-CSB in 2014. He learned that the school offers scholarships for working students. So, despite already being 34 at the time, Emmanuel grabbed the opportunity. He was a janitor by day and student by night; this left him very little time for his family. They were asleep when he arrives home after school, and they were still asleep when he leaves at 3AM to start his daily commute. But this janitor dad did not give up on his dreams. For the sake of his children, he didn’t want to be a janitor forever. He did his best to pass all the subjects in his course, Bachelor of Science in Business Administration diploma, major in Business Management. Challenges rocked Emmanuel’s life but he remained strong. His wife and kids had to move to Bacolod in central Philippines so she could care for her ailing mother. He had to deal with loneliness but couldn’t also change the situation as he needed to complete his studies. Then, in his final year he met 27-year-old Karl who became his thesis partner and best friend. Understanding Emmanuel’s situation, the younger Karl played the role of his ‘older brother’, giving him advice and shouldering much of the thesis costs. But just days before they were supposed to submit the paper, Karl was diagnosed with a terminal condition and passed shortly afterwards. It was a huge blow for Emmanuel. Thankfully, he managed to hold on to his dreams and focus on his goals; it was difficult and it took him a long time to cope but he eventually got back on his feet again. 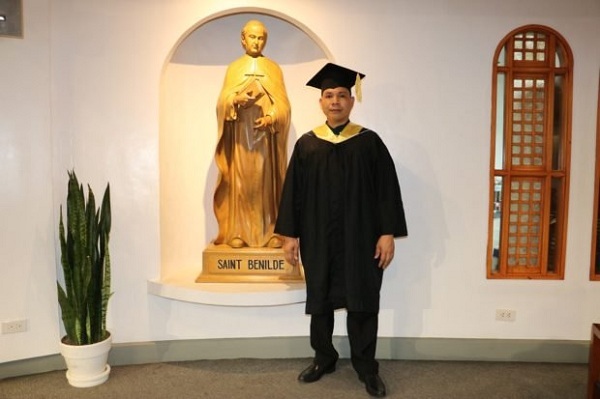 Last June 2018, Emmanuel was among the proud graduates of DLS-CSB, the college he cleaned every day. He plans of applying for an office job and saving money so he can eventually start his own agricultural business.